Of all the ways that you can sum the 80s up, one that’s particular close to the hearts of metalheads is that it’s the decade in which Judas Priest hit the big time. Metal gods they were, in sound and spirit, and Screaming For Vengeance captures them at their big-time best, a huge step forward from the more hard rocking Point Of Entry and a million miles above the shaky keyboard-infested Turbo. Mixing razor-sharp metal and the band’s songwriting skills at their best, it remains a vital 80s album for all metalheads, alongside its follow-up Defender Of The Faith. The rhythm section here is too staid and samey to really threaten other albums as Priest’s absolute greatest, but in terms of vocals and guitarwork it’s up there with the best. The killer songs are constant, the opening classic anti-authoritarian anthem Hellion/Electric Eye setting a high bar which (in my opinion, at least) is broken a couple of times by the songs here. First and foremost of these is the excellent Riding On The Wind, a road anthem, Halford’s shrieking vocals the gloriously catchy structure around which molten guitar goodness is poured, far too short at just over three minutes. Although this album isn’t as varied as certain Priest classics (Stained Class, here’s to you) it keeps you listening by adding elements of top-notch balladry where necessary, such as the ever-underrated (Take These) Chains and the slightly clunky Pain And Pleasure that succeeds due to the sheer effort Halford puts into belting the lyrics out. The following title track is another that threatens Electric Eye, of course, that opening scream waking you up and duly taking you on a metal trip to the stars. It’s all too easy to forget how enjoyable good, fun, heavy metal can be, when your days are full of death and black metal darkness. The stomping crunch of You’ve Got Another Thing Comin’ has a real life-affirming quality to it which gladdens my gloomy heart, lyrics about being ‘on top whilst the music’s loud’ far more cheerful and relatable than the escapist dragons and demons that more flowery subgenres are filled with. Triumphant choruses on the likes of Fever ring with the passion and conviction that fills the hearts of music fans, whilst the hard-rocking Devil’s Child brings proceedings to a close with style. The remaster has some rather good bonus tracks, particularly Prisoner of Your Eyes, a big epic keyboard-heavy expression of lust, and there’s a live version of Devil’s Child too. As I get older and Painkiller goes from being the pinnacle of metal perfection to an amusing if over-the-top last hurrah, so the band’s earlier albums have increased in my affections where once I’d have all but ignored them. As mentioned, classic heavy metal has a power and calling that’s more timeless than the temporary extremities of the underground genres; I can listen to this in any mood, any time of day, and get as much enjoyment out of it as ever. 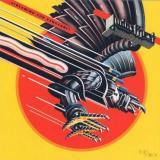 Judas Priest are masters of their genre, and Screaming For Vengeance is one of their best – a must for all metalheads.